own without a continuous external influence. crystalline substance at 0 K is zero. substance at 1 atm pressure and a specified temperature. entropy of a system and its surroundings always increases. The reaction mixture is at equilibrium. universe. Will the reaction be spontaneous? DG < 0 The reaction is spontaneous. DG > 0 The reaction is nonspontaneous. DG = 0 The reaction mixture is at equilibrium. usually 25 °C; 1 M concentration for all substances in solution. Is the reaction spontaneous at standard-state condition? Does the reaction become nonspontaneous at higher temperature? 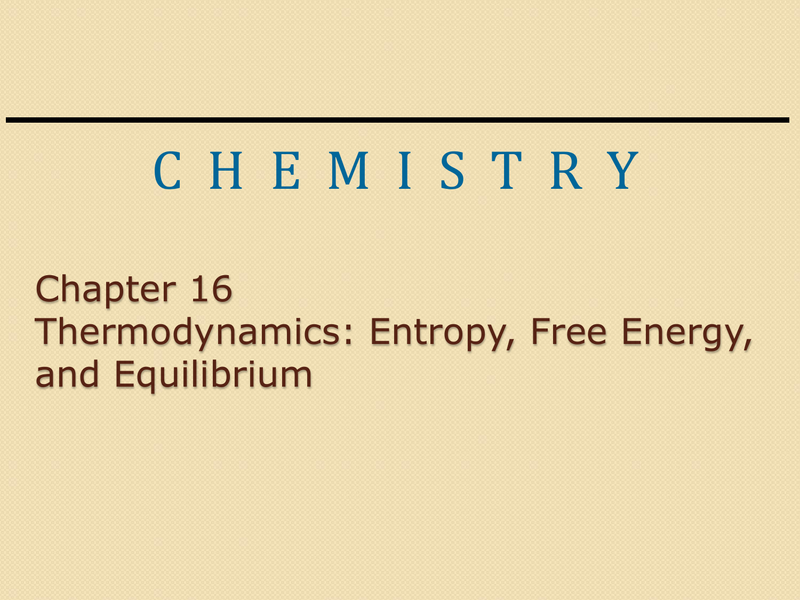 DG = Free-energy change under nonstandard conditions. °C when the partial pressures are 100 atm H2 and 0.10 atm C2H4. Is the reaction spontaneous in the forward or the reverse direction? At equilibrium, DG = 0 and Q = K.
The value of ΔGof at 25oC for gaseous mercury is 31.85 kJ/mol. What is the vapor pressure of mercury at 25oC?